I’m nearing the end of my work with Kris Hughes’s year-long Cauldron Born ritual. This Working has been intense, powerful, transformational–everything you want from a ritual of this magnitude. Though I thought I’d become accustomed to being surprised, this month was more than a little bit startling. I’ve varied the ingredients for the ritual quite a bit, mainly because I want them to come from the land that I walk every day, not from some sterile mail order apothecary. Originally, this month worked with acorn (which I have in spades) and rowan berry, or mountain ash, which seems to be non-existent on my land. Naturally, I needed a substitute. Much of the discourse surrounding Rowan in the recipe focused upon it as a witch’s herb, so I decided to explore that theme in my own backyard: what herbs were particularly witchy? Despite my earlier work with Datura, I didn’t recognize her in her fruited state. And I hadn’t picked up on her flowers for the simple reason that she was growing in a field full of morning glory and a casual glance enabled her to blend in. At first I thought she might be horse nettle, which we have in abundance, but there were no thorns in the undersides of her leaves. Fortunately a Google search for “thorny fruit” popped up a picture of exactly the regal Lady who was gracing the remains of my horse dung heap. To be clear, I still do not advocate the ingestion or inhalation of entheogens. Maybe part of that is because I’m so damned sensitive to these plants anyway–just pulling mugwort or (as it turns out) datura without gloves can be enough to rend the veil for me. So I really see no need to go on a potentially days long, damnably dangerous trip. These spirits are not for fun. They are not here for shits and giggles or for your amusement. From all accounts, Datura in particular can be a very harsh mistress to those just seeking a high or shiny new experience. You’d think the spike-riddled flesh of her seed pods would be a hint about her nature. The other ally simmering in my “cauldron” this full moon was flowering tobacco. On a whim, I also decided to look up what type of Nicotiana I had planted around my squash. As it turns out, he was a sort of Grandfather Tobacco, Nicotiana silvestris. This was one of the parent plants of modern smoking tobacco, though he has a much, much higher nicotine concentration (which ironically enough, is why people don’t smoke it–unless you’re looking for a pretty rough high, apparently). Grandfather is now taller than I am, with some of the sweetest smelling flowers in my garden. 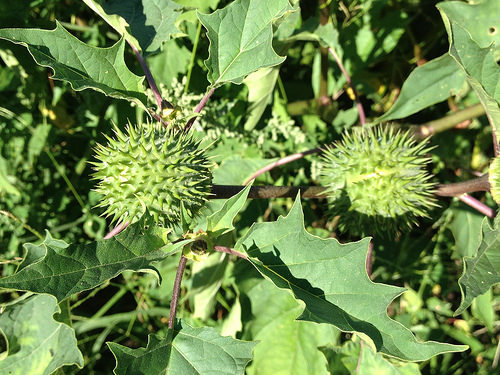 While not as outwardly witchy as Datura, this was certainly a plant sacred to the native peoples of this continent; he also provided a make balance to the overwhelmingly feminine energies of Datura. One of the most powerful things about the Cauldron Born rite is that it has given me permission, as a Druid, to act like a Witch. So often a false dichotomy is set up between the two paths, and it has been wonderful to nurture and develop the “Low” magick side of my practice. It has been such an incredible exercise in embracing my own power and stepping through fear to come out the other side strong and certain in my own agency. Hail the Vates, the Drian, the Swyngyfaredd! Hail Quercus! Hail Datura! Hail Nicotiana! Hail Cerridwen, Goddess of Witches!